More Europeans at the end of the 15th century were engaged in fishing than in any other occupation except farming. This fact reflects the importance that fish played in the everyday diet of Europeans. It was a source of protein that was easy to preserve, transport, purchase and prepare. Moreover, in an age of rising (and warring) nation-states, fish made an ideal military ration. National governments came to regard all maritime activities, including fishing, as essential to the training of seamen needed by their navies in time of war. Thus governments promoted fisheries not only because fish was valuable as food and as an article of trade, but because they were "nurseries for seamen". Even Protestant England would legislate "fish days" to increase the consumption of fish. The discovery of new fishing grounds as rich as those at Newfoundland was guaranteed to attract the interest of all Western European countries. News of what Cabot had found spread quickly throughout Europe. Within 10 years of his voyage, significant numbers of European fishermen had begun to make the annual trip to the "New Found Land" to catch cod. Few of these fishermen were English; instead, Bretons and Normans from France, and Portuguese, predominated during the opening decades of the 16th century. Breton fishermen were visiting Newfoundland as early as 1504, while Norman fishermen learned about the fishing grounds from Thomas Aubert, who had made a fishing and reconnoitering voyage in 1508. 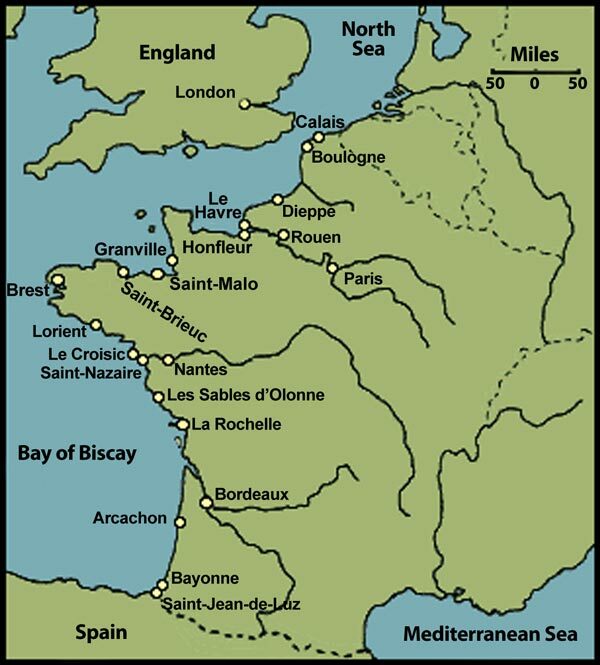 By the 1520s French ports regularly sent out between 60 and 90 vessels each year. The size of the Portuguese fleet is unknown. After about 1540, Basques from northern Spain added another element to what historians refer as the "International Fishery", so that by 1578 Anthony Parkhurst was able to count over 100 Spanish vessels at Newfoundland, all seeking cod. In contrast, the level of English activity during this period was quite small — Parkhurst claimed that in 1573 there were only four English vessels at Newfoundland. Illustration by Tina Riche, 1997. Why was this? Why were the French and Portuguese so quick to take advantage of Cabot's discovery, while the English, who after all had sponsored his explorations, were so slow? Part of the answer may be location. The forerunner of England's Newfoundland fishery was its Icelandic fishery. This was based in the seaports of England's north-eastern coast, on the North Sea, which were poorly located to exploit the Newfoundland fishing grounds. In contrast, the south-western seaports (in the so-called "West Country") were ideally situated to exploit fishing grounds on the other side of the Atlantic. Eventually they would come to dominate the Newfoundland fishery, but they could not develop a cod fishing industry overnight. Nor could they establish markets right away for a product that was so new to them. The French Atlantic seaports that were conveniently located to take advantage of the new discovery had already become skilled at cod-fishing in the North Sea. What is more important, they already had developed markets for cod in northern and eastern France. Markets were another important factor. The fish caught at Newfoundland by Breton and Norman fishermen ended up in inland markets such as Rouen and Paris. Portuguese and Spanish fishermen benefited from the fact that their countries were staunchly, even militantly, Catholic, with a strong demand for fish to consume on fast days. In addition, both countries had growing sea-borne empires in America and Asia, and needed cod to feed the mariners and soldiers who were associated with that growth. England, in contrast, had no comparable expanding domestic market. Its Icelandic and local fisheries satisfied the demand for fish. In the absence of some other market, there really was no incentive for English ports to develop a major fishery at Newfoundland. While a decline in the Icelandic fishery encouraged the expansion of the English fishery at Newfoundland, significant growth occurred only after the Spanish and Portuguese fisheries went into decline. This forced southern European consumers to look for foreign suppliers of cod. The English West Country ports had found the market they needed. 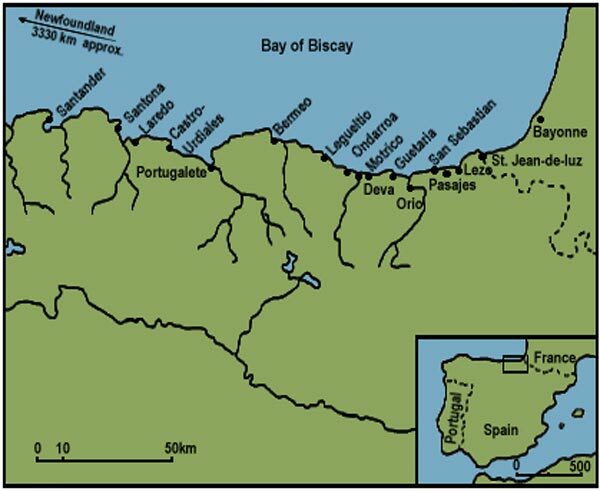 The decline of the Iberian fishery (that is, the fishery of Spain and Portugal) had less to do with events in Newfoundland than with developments in Europe. The Spanish fishery was based in the Basque region in the northern part of the country. The enormous wealth which Spain was plundering from its American possessions helped to finance the development of a powerful and highly centralized government in Madrid. This government began to assert itself through all sorts of new regulations and restrictions. These interfered increasingly with various economic activities, including the fishery. 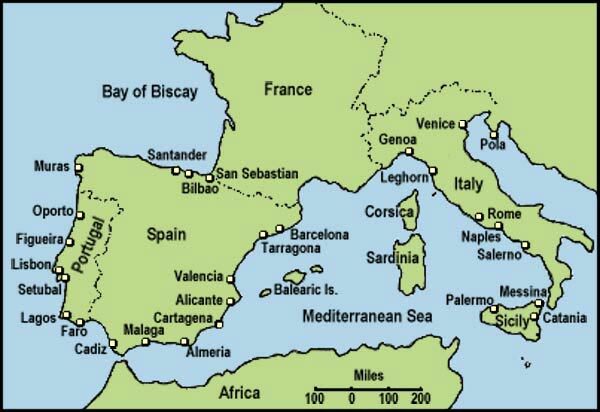 At first the Spanish Basque seaports tried to ignore many of these measures. However, in time new taxes, combined with restrictions on trade and shipping, weakened the ability of the Spanish fishermen to compete with their European rivals. In addition, the great 16th century inflation caused significant price rises. So far as the Spanish fishery was concerned, this meant increased costs, while the rising price of fish encouraged foreign suppliers to penetrate the Spanish market even further. Worst of all was the crippling effect of Spain's war with England that began late in the 1580s. Not only did the government requisition commercial shipping and seamen (including those from the fishery) for military purposes, but Spanish trade was now exposed to attack by English privateers. In 1585 Sir Bernard Drake carried out an extensive attack on Spanish ships in Newfoundland, although he was careful to avoid Spanish centres like Placentia and the Strait of Belle Isle. The Spanish retaliated with attacks on English and French shipping in 1587 and 1588. However, the Spanish cod-fishing industry never completely recovered. Portugal suffered too, because in 1580 she had been absorbed by Spain. The Portuguese fishery was subjected to the same ill-effects of Madrid's policies as its Spanish counterpart. Until peace was restored in 1604, the English continued to be aggressive in seizing and destroying Iberian fishing ships. The destruction of the Iberian fishery at Newfoundland was not absolute and complete. Spanish and Portuguese fishermen continued to cross the Atlantic throughout the 1600s. There are French reports of Spanish fishermen at Placentia in 1655, and English reports of Spanish fishermen north of Bonavista after 1660. These suggest that a Spanish sedentary fishery may have struggled on to the end of the century. But their numbers were so reduced that, for all intents and purposes, they might not have existed. This created an exciting opportunity for the French and especially for the English. Spain and Portugal wanted cod, and so did other Mediterranean buyers, such as those in Italy. Since the Iberian fishery could no longer provide the necessary quantities of fish to satisfy that demand, southern Europe turned to anyone who could. The two countries that benefited the most from this situation were France and England. Between 1545 and 1565, the number of fishing vessels outfitted at Bordeaux increased from about 20 per year to 40, the number at La Rochelle increased from about 12 to over 40, while the number at Rouen increased from roughly 12 at the beginning of the 1540s to over 90 by the mid-1550s. Les Sables d'Olonne may have outfitted 100 vessels by the second half of the 16th century, and substantial increases also occurred at La Rochelle and Le Croisic. The English fishing fleets also expanded from around 30 ships per year to as many as 200 by the end of the 1500s. In 1615 Richard Whitbourne estimated there were 250 English vessels carrying 5,000 men and catching fish worth £120,000. However, there is really little doubt that France was by far the superior of the two. At mid-century, French fishing vessels outnumbered English ones by roughly two to one. Such growth did not necessarily lead to friction between the fishermen of the two countries. The French and English fisheries at Newfoundland were sufficiently different at this time that there was nothing intrinsically competitive or incompatible about them. The English, favoured a "dry" cure in which the fish were brought to shore where they were cleaned, split, and laid out on elaborate "flakes" to dry. Although this method used salt much more sparingly, the product was ironically known as "saltfish." The dry cure was undoubtedly a better cure; the fish was less likely to spoil, giving it a longer inventory life and thus more flexibility both in its sale and in its use. Although the French Basque fishery was a dry fishery, as were parts of the Breton and Norman fisheries, the French generally preferred a "wet" cure, in which the cod was heavily salted in the hold or packed in brine. The resulting product was called morue verte ("green cod"). Consequently the French did not feel compelled to challenge the English, who were quickly establishing themselves on the shores of the Avalon Peninsula. Although a French dry fishery had sprung up by 1600 in response to new market opportunities, there were plenty of places to catch and cure fish besides the Avalon Peninsula, such as the Gulf of St. Lawrence and even the North American mainland. Generally, the French were not interested in establishing territorial claims in Newfoundland before the middle of the 17th century. Market opportunities were not the only factors in defining the nature and growth of the English and French fisheries. Historians have often explained the choice between the dry or wet cure by reference to the availability of salt. France had an abundance of salt and in consequence its fishermen favoured a wet cure; England did not have an abundance of salt and in consequence its fishermen favoured a dry cure. It is now thought that it was the market which determined the choice of a dry cure by the English fishery, since this is what was wanted in Spain, Portugal and the Mediterranean. The French eventually responded in the same way, despite their abundance of salt. The two fisheries also differed in the trading patterns that had begun to take shape by 1600. The French fish trade served a diversity of markets, both domestic and foreign. The Breton and Norman ports initially responded to domestic markets for "green cod" in northern and eastern France. As a market for saltfish developed in Spain, French channel ports, and especially southern French Basque ports developed a dry fishery as well. In other words, we cannot characterize the French trade in fish any more easily than we could characterize the French fishing industry. It did not base itself in the ports of a single region, it did not favour a particular kind of cure, and it served a diversity of markets, both foreign and domestic. The English fish trade presents a striking contrast. Ignoring the domestic market, English merchants concentrated their efforts almost completely in the market ports of southern Europe. They had quickly recognized that the saltfish trade was a reliable way to redirect some of the riches of Spanish America to England: fish could be traded for bullion, or used to purchase fruits, wines, and other desirable southern European commodities. At first, the fish-laden ships returned to their home ports in England where the fish would be transshipped to market. Gradually this practice ended, and the fish was sent directly to Spain or Portugal from Newfoundland. By 1600, the fish was often stored on vessels whose sole purpose was to transport such cargoes, and which arrived at Newfoundland as the fishing season ended. Usually much larger than fishing vessels, they were known as "sack ships." The origin of this name is not clear. The preferred explanation is that these ships were also used in the Spanish sherry trade, and sherry was commonly called "sack." Or perhaps "sack" was a corruption of sec or sèche, the French word meaning dry, which identified the saltfish (morue sèche) which was the ships' cargo. Recently Peter Pope has argued that the term sack is almost certainly derived from "vino de sacca" or "wine for export" (Pope 264). The resulting pattern of ship movement (from England to Newfoundland to southern Europe and back to England) has been called the "triangular trade." This is something of an oversimplification. The vessels which carried the fishermen from England to Newfoundland were not necessarily the same vessels which carried the fish from Newfoundland to southern Europe. Nevertheless, there is some truth to the term, since it accurately describes the principal directions in which investment capital (in the form of shipping and cargoes) moved within the Newfoundland fishery. During the period of the 16th century international fishery, the European migratory fishery at Newfoundland became firmly established , along with some of its fundamental characteristics. Who participated in the fishery, how and where they fished, how and where they disposed of their catch — these and other features were firmly in place by 1600. By this time France was dominant in the fishery and England was its only serious rival. Conflict between the two countries at Newfoundland was not inevitable: the fishery was a common property resource over which exclusive jurisdictional rights could not yet be exercised; the French favoured more than one curing process, which reduced the risk of conflict with the English; and the French fish trade did not necessarily respond to the same market demands as did the English trade. Yet as each country entered the age of competition for trade and empire, each would come to view the fishery as a national asset. As a result, control of the fishery would become an issue for conflict.